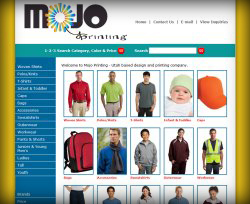 Q: What is the minimum order for screen printing? A: Our minimum order is 18 pieces for up to a 6-color imprint. We can also print full-color images using 4 color process for an extra charge. A: Our turnaround time for a screen printing order is 7-10 business days from the final art approval. If the order is shipping, there is also additional time to ship from Utah. Q: What about rush jobs? A: Rush jobs that must be completed in less than 7 to 10 business days after the final approval of your art and are subject to a 30% addition to your total. We cannot always accommodate rush jobs, so please check. Q: What is the proof / approval process? A: On all new orders we will be sending you an art proof for your review. This proof will state the size, colors and overall location of your print job. Please make sure to look over the proof carefully as once it is approved we will be printing exactly that. Proofs are issued about 2 business days after all forms and art have been received. Once you send us a confirmation, we will send you back a receipt to let you know the job is underway. Q: Do you provide the clothing? A: Yes. We have blank clothing lines that you may choose from. Or you may wish to provide us with the clothing. Note that there the possibility that clothing can get ruined in the screen-printing process. We may deliver up to 3% short on your order. If you provide your own clothing, you may want to order 3% more than you need just to be safe. If you use our clothing and order 100 shirt, you will receive 100 shirts. If you provide your own clothing and send us 100 shirts, you could possibly only get back 97 shirts. Q: How can I get an estimated shipping cost for my order? A: We typically do not know how much your order will cost to ship until it ships. We are only able to give exact costs for shipping when we are actually processing the shipment. Q: I have my own UPS/FedEx account. Can I use my own account number for shipments? Q: What art file formats do you accept? A: The preferred format is ..ai (adobe illustrator) or eps (encapsulated post script). A high-resolution raster file such as .psd, .jpg, or .tiff (300 dpi) can also be used. If all you have is a lower resolution 'web image', there may be a fee to have our artist recreate it in a better format. Q: Will my shirt image be as clear as my photograph or printout? A: No. Process printing on textiles is of a lower resolution than ink on paper. While the color and image quality are good, they are not as crisp or detailed as a photograph. Textiles are printed at 55 lpi whereas color pictures can print at upwards of 200 lpi. Refunds are not given because an image on a shirt doesn't equal the print quality of a photo. Q: I don't know how to get my logo prepared in the format you need. Can you help? A: Our graphic artist will review all work submitted for printing. If needed, changes will be recommended. If you are having trouble working out your design, we will be happy to work with you to get your design just right. Q: What is the least expensive shirt to have customized? A: The least expensive T-shirt would be a white shirt with a 1-color design. A: Sales tax is only charged on orders detined for Utah. If you have a resale number from Utah, we'll have you fill out a form so it can be sales tax exempt. A: Online payment is handled through Visa or MasterCard. You may also make payment over the phone using Visa or MasterCard. Q: Can I have you change the garment color on part of the order? A: Yes, this can be done at no extra charge as long as the image or ink doesn't need to change. If only the ink color needs to change, we can do it for a $25 color change fee. Q: Do you allow changes to an order? A: We will try our best, but once placed, an order is final and cannot usually be changed. This policy exists because of workflow issues involving screen supplies, garment orders, and scheduling press time. Please make sure your order is exactly the way you want it before ordering. A: No. Cancellations are not allowed due to the speed with which work begins. Once placed, an order is final. Q: How are names and numbers printed? A: Names and numbers are usually cut from vinyl and heat pressed onto your shirt. Vinyl letters and numbers are the industry standard for teams/groups that require a variety of individual names/numbers for their order. Names and numbers can be screen printed if the name and number is the same on every jersey (such as a replica jersey), but usually does not turn out as good as the vinyl.